The HUB4 is a four port USB 2.0 hub with mounting holes, a screw terminal for input power, and per-port power control. The HUB4 card was designed with robotics and automation in mind. 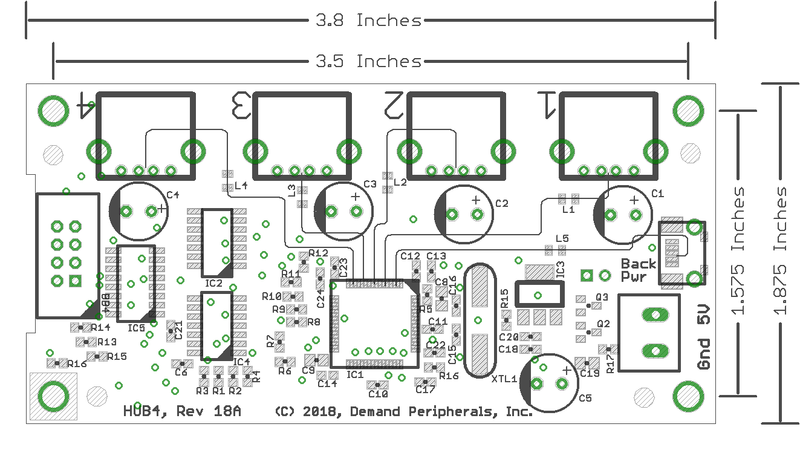 Four mounting holes make it easy to securely mount the card to a chassis, and since the card is intended for long-term production you can rest assured that you'll be able to get the same USB hub when you build copies of your robot. Power is crucial on battery powered robots and the HUB4's per-port power control means you can turn off GPS, cameras, and other high power components when your is stationary or otherwise idle. Leave the connector unconnected and the card operates with all ports powered. If power is important to you, this is the USB hub to have. The HUB4 requires an external 5 volt power source; it can not be powered from the host. Power comes in on screw terminals so there is no chance of having intermittent power due to vibration causing an open circuit on a barrel connector as there would be with normal USB hubs. An optional connector on the board lets you power your host device from the hub. A "hub powered host" violates the USB specification but is sometimes useful when your host is a phone, tablet, or other On-The-Go (OTG) device. The header and jumper are not installed by default and if you use this feature please be sure to verify that your host device can be powered from a USB hub. The schematic and layout of the HUB4 are shown below. The Eagle schematic and board files are available here: hub4.sch and hub4.brd. The HUB4 can operate stand-alone and does not require a slot from the FPGA card. 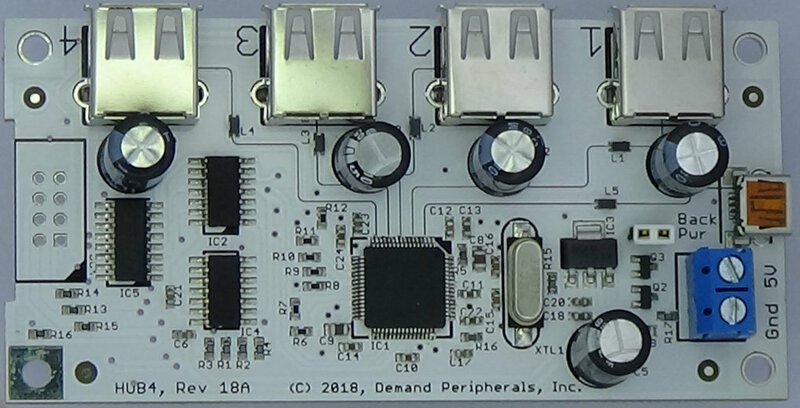 However if you with to use the per-port power control from your host computer you may want to pair the HUB4 with an OUT4 peripheral on the FPGA. This will let you easily turn on and off power to each port on the HUB4.